The Jumbo Chrome Elite features a thick foam handle that offers comfort and style; ideal for people with limited grasping ability or pain and stiffness due to Arthritis. It has four solid rubber tires with chrome plated steel spokes, a large, roomy basket, and will hold loads up to 150 pounds. Use it for shopping, laundry, gardening, meals on wheels, etc. The cart stands 40.75 inches tall from floor to handle. The basket is 14.5 inches deep, 17.5 inches wide and 24 inches tall. The rear wheels are 10 inches in diameter; the front wheels are 6 inches; and it weighs 14 pounds. 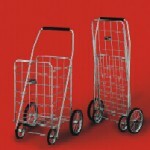 The cart folds flat when not in use and easily fits in the trunk of a car, in a closet, or underneath a bed. Optional cart liners are available. Choose from a heavy duty vinyl liner with a hooded top or a waterproof nylon liner with a draw string top. Both are sold separately and come in BLACK ONLY. 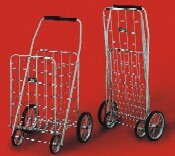 Other optional accessories for your shopping cart include a cane holder and a drink holder. They both simply snap to the side of the cart and the Drink Holder will hold a standard size cup, mug, or bottle. 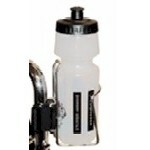 Attach this water bottle holder to your cart! 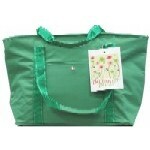 Take along this insultated shopping bag to keep your cold things cold and your hot things hot.